Ruth! Don't quit, especially not after what I've just managed! And especially after all the hassle of making my own dough! There is so much to concentrate on for the unseasoned cook. Even when it's done, the madness doesn't stop. Cut to an inch? Well that's all very well if you don't have a ruler to hand, not forgetting a 'boy inch' is apparently different to the universal measurement. So, despite having lost the will to get off the sofa after long trips away for work and a desire to just stop everything, I went out on a little bike ride with some of my rowing crew along the pathways to Clevedon. 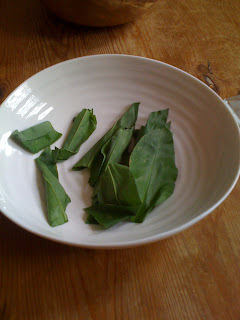 And when out in the south west what better to do than forage? So, Mark, Fraser and I were on the look out for wild garlic. So I managed to follow your recipe to the letter, and I have to say that even making scone dough is a bit tough on the old hands eh! I thought the breadcrumbs would never form. It is magic when it comes together though. In they went and out they came, a success! But, as you may have come to expect with me, cooking is never straightforward. Oh yes, I followed your bacon and cheese scone to the letter, where of course the cheese was missing from the original recipe due to blog gremlins. So what you see above are simply not quite wild garlic scones. And, sadly, they were cooked on the outside but not on the inside. A failure. I hope this inspires you to keep posting your recipes.